Fr Manus Sweeney (1764-1799) is said either to have been born on Achill (Dookinella Thulis) or to have been the son of a man from this village. According to folklore, his death by hanging was predicted on the night that baby Manus was born. Some accounts say it was a beggar lodging in the mid-wife's dwelling in Dookinella who prophesised that a baby born in the village that night would be a great man, but would also be hanged. Other accounts claim that the captain of a ship that had run aground that night had issued the prophesy. In fact Fr Sweeney was indeed hanged following the failed 1798 uprising during which he was seen talking in French to one of General Humbert's invaders of Mayo (some accounts claim that Fr Sweeney, who was educated in France, was actually talking to a former classmate). 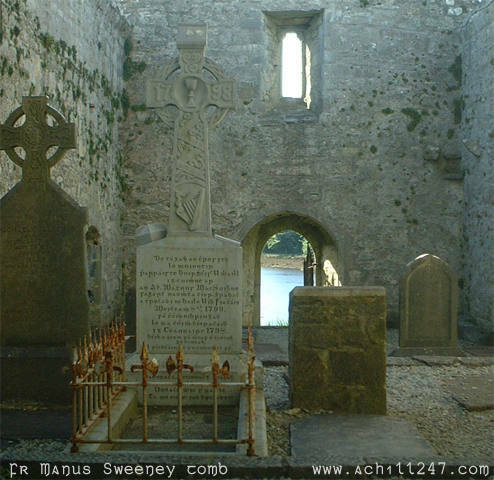 This tomb in Burrishoole Abbey marks the grave of Fr Manus Sweeney.